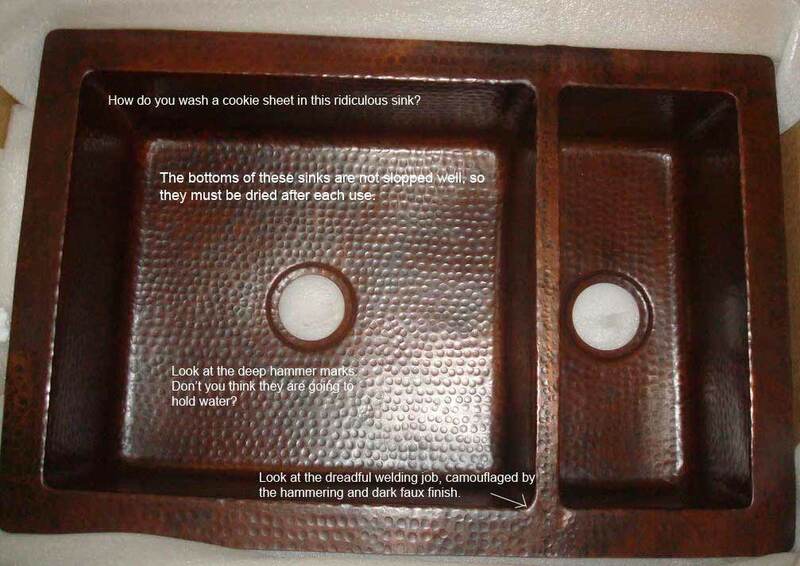 Copper sinks: Frequently Asked Questions. Pro's and Con's. Frequently Asked Questions about copper and stainless steel sinks and more. This is a long page, likely the most important. Read on if you dare! 1. Why are Rachiele Custom Sinks so different from ALL other sinks on the market? 1. There are so many claims made by copper sink companies, how can you determine fact from fiction? The photo to the left is what we see all the time. When the sink is level, it pools water. This is one of the reasons the imports (and this American made sink) require drying after each use. Do you want to wax your copper sink regularly? (No need to wax our sink) Do you want to find out your copper sink does not drain properly after it is permanently installed in your kitchen? (Ours are guaranteed to drain properly) Do you want to find that blemishes inside your sink are permanent? (Can not happen with ours) Do you want to find out, after the fact, that Clorox can permanently damage your sink? (Clorox will not harm our sink) Do you want to find out after a year that you have no warranty on your sink? (Our warranty is for life) These are just some of the risks you take when you buy a copper sink based on price without doing research. The answer is simple. Just look at the warranties, use and care and return policies. 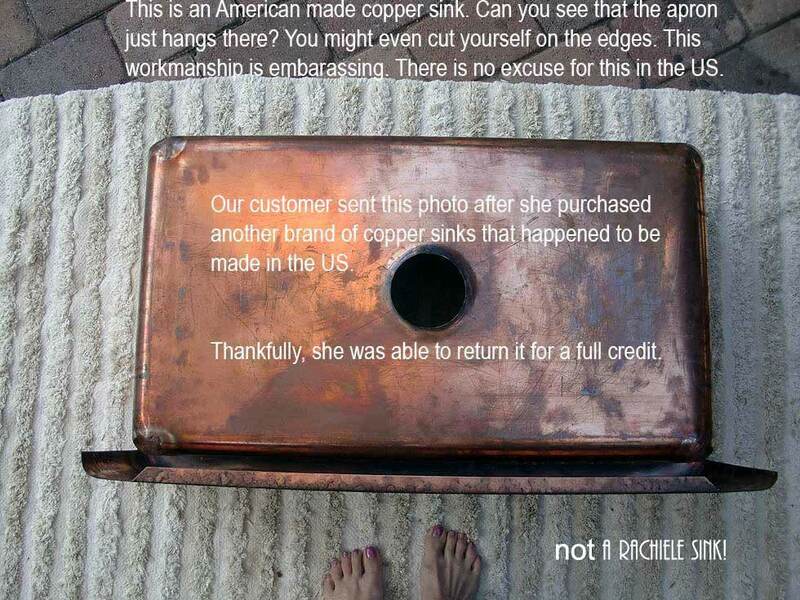 The warranty on a copper sink should tell you if you are dealing with a company that stands behind its products. Our warranty: Lifetime Transferable Warranty. Our Return Policy: Money back plus $100 if you are not thrilled with the quality of our sink! No other copper sink company on this planet offers any of these benefits! I humbly ask... Do you want to buy a sink online where the company is embarrassed to indicate where the sinks are manufactured? 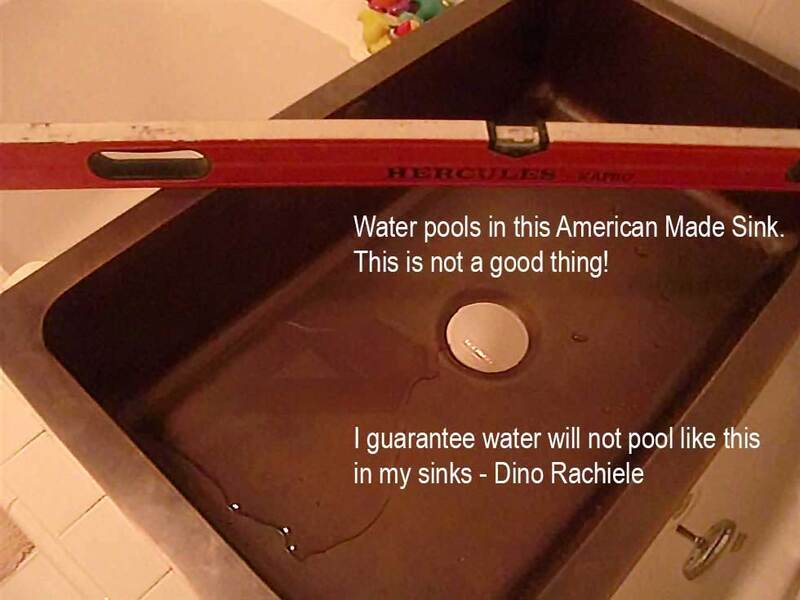 A Rachiele sink will not look at all like the sinks found in the Home Centers. It will not look like a cheap import. It will always look like a custom luxury sink. I recently sold one of my used 9 year old copper sinks for $1500 - more than most new imported copper sinks sell for. Would you ever mistake a Rolls Royce for a Chevy? A Bentley for a Ford? Maybe in a photo, but not in person. Photos do not tell the entire story. Once you see one of our sinks in person, the difference is quite evident. Our designs are not trendy, they are distinctive. I believe the dark, hammered copper look will be a trendy fad - so will the curved front apron sinks. Curved front sinks are an ergonomic nightmare. Think of this... Whenever products hit the home centers, the middle and high end buyers look for something else, something that stands out from the crowd. Most imports have radius corners and hammered finishes. When you pay a bit more for a Rachiele sink, you are getting several benefits you will not receive anywhere else. WOW, I just Googled "Copper sinks" and went to a dozen websites. NOT ONE had a link to their warranty on their home page. You have to hunt and hunt - and some I just could not find any warranty information. Look to the top of every page on our site, you will see a link to our warranty. It makes you wonder why they hide their warranty and use and care info. (By the way, the only ones I found had a one year warranty) Hmm - no moving parts, why only a one year warranty? Could it be that it takes about a year for the lacquer or the unnatural sink interior patina to wear through? Sure makes me wonder. 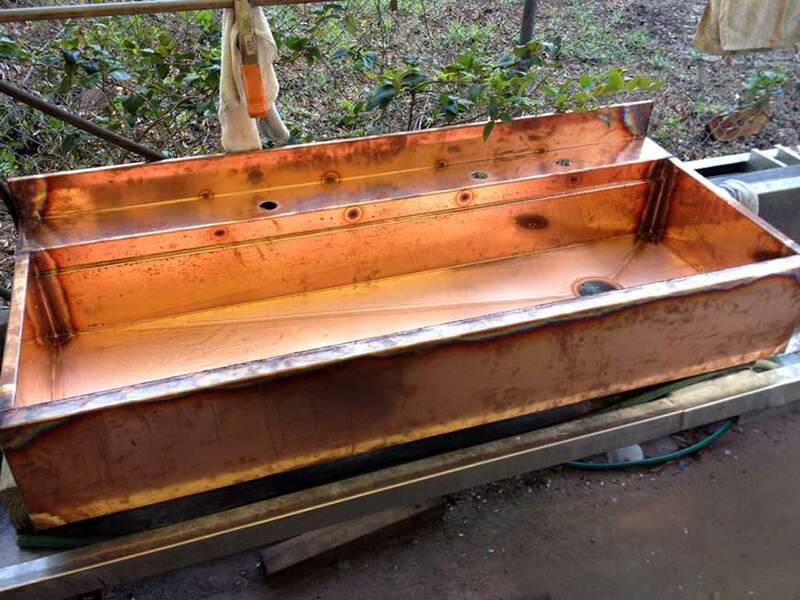 Oh, my favorite find is of a company I saw online with a great video showing some of the pitfalls of buying a copper sink that was made of recycled copper. The sink was pitting and some of the copper was flaking off. They indicated in the video that you should look for a company with a 10 year warranty. Well, I thought to my self, that is better than the normal one year warranty. However, when I looked at their own web site at their warranty, it was for only 5 years. Come on folks, you just can't make this stuff up! Custom fitted sink with rear corner drain - it just makes sense! Self healing copper interiors - just rinse and wash with normal dish soap. NO OTHER MAINTENANCE! Exclusive NexGen Workstation stainless and copper sink designs. No other workstation sink can compare! Optional Patented apron front sink design allowing for installation in existing sink cabinet with no modification to the cabinet. Corner rear drain allows for full size double trash pull-out under sink. 2. Still not impressed? Think about this. All other sink manufacturers have made up fancy names. My family name, Rachiele, is branded on every sink that leaves here. If you were building sinks under your name, would you build second best? 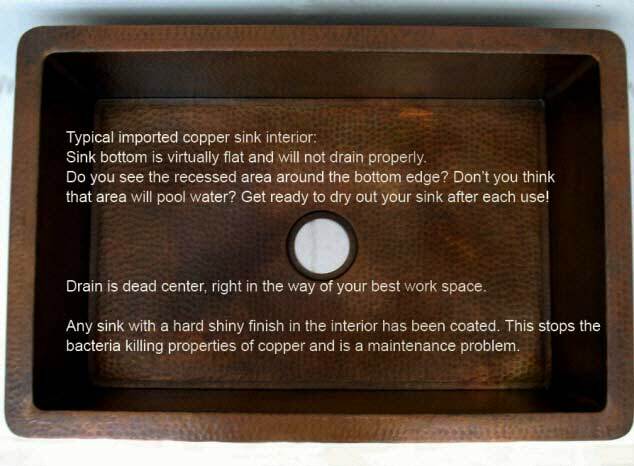 First, our copper sinks do not require drying after each use like the imports require. We also do not tell you that you cannot use abrasives or acidic foods in the sink like the imports mention. How can our sinks be so different? Simple... First off, our sinks are designed to drain properly (and are guaranteed to do so). Any copper sink that pools water will require drying after each use. The imports are notorious for pooling water. Secondly, the reason you don't have to worry about abrasives or acidic foods in our sink is that we understand the true nature of copper and do not alter it. No matter who makes the copper sink, at some point, the finish on the bottom of the sink is going to be disturbed or removed. With the vast majority of the imports, the interior finish is either lacquered or an unnatural color for copper. So, when the finish is disturbed and the copper regenerates a patina, it will NOT match the original color of "their" sinks. 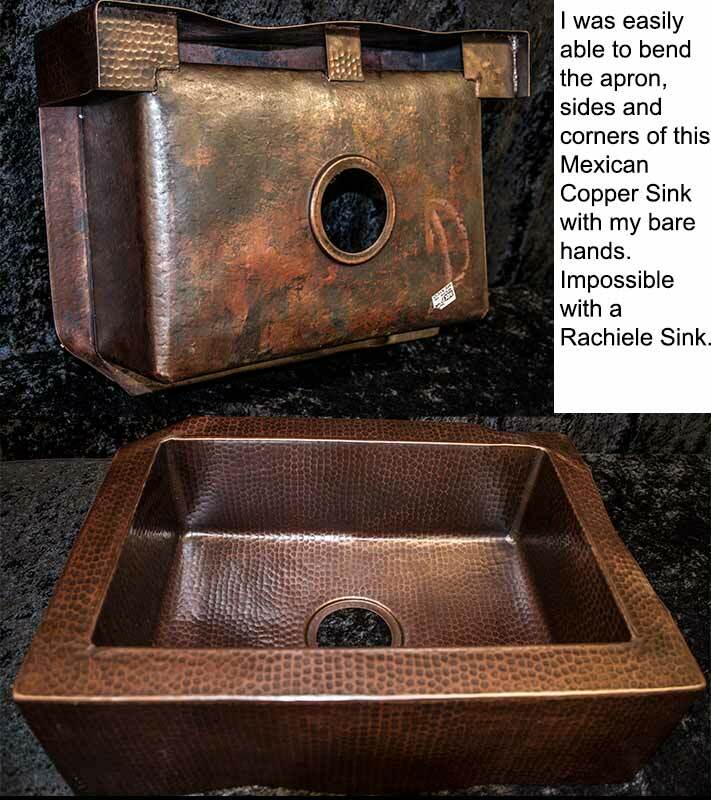 Rachiele copper sink interiors are weathered naturally using only household vinegar and a sponge. We bring the copper to its natural coloration (the color of an old penny). So, when the patina is disturbed, it will regenerate back to the original color range and will not look like a blemish. Think about it... our sink designs just make sense! Why in the heck do the other guys put drains in the middle or rear center of the sinks? There is logic to that at all. All of our sinks feature well thought out rear corner drain locations. Rear corner drains allow you to use our large single bowl sinks like a double bowl sink - but without that crazy divider that gets in the way of washing larger items. With my sink, you wash on the right, set off on the left to drip dry. Just as you would in a double sink. Unless you fill one bowl with soapy water every time you wash dishes, double bowl sinks are OBSOLETE for most folks! The Rachiele NexGen sink is the logical culmination of over 30 years of ergonomic research. My sink was the first sink on the market that can be used for all food preparation and clean up with ergonomic ease. All sizes of pots, pans and platters easily fit in the sink for cleaning without covering the drain. All food preparation can be accomplished without soiling the adjacent counter top. There are some companies that have attempted to copy my design, with less than desirable results. Most have put the ledge too high or too low in the bowl, so that the cutting board sits higher than the sink - making it impossible to run water over the cutting board or so low that you hit your wrist while attempting to cut. The copper or stainless grid are easy to clean, allowing foods to be placed on it without worry. Set meat, poultry or vegetables on the grid to drain, then cut on the cutting board, then slide over into a bowl waiting in the bottom of the sink. Both items are easily removable for simple storage under the sink inside the cabinet below. Let's look at precision. You will read that most imported copper sink manufacturers say that their sinks may vary as much as 1/2" from the ordered size. They claim that this is because the sinks are hand made. Really??? That makes my head explode! Come on, look at the fine "hand made" products that are exact to within a 1/16". Again, ancient Egyptians built hand made items without modern tools with much more precision. Our sinks have less than a 1/16" tolerance and are just as hand made as most of the imports. The only portion of our sink that does not require "hands-on" work is the cutting of the copper. I have measured several imported sinks and have found them up to 3/8" out of square. I grew up in the hand made furniture business and "hand-made" was never an excuse for size variations. Our sinks are square, true and the size you order. If we build a sink that is more than 1/16" from any measurement, we rebuild it and the sink ends up on our clearance page. Rachiele sinks are T.I.G. welded using pure copper, and the welding is the finest you will see. A few years ago a gentleman, who was quite familiar with welding, looked at the copper hand weld in a copper sink welds on our sinks and was impressed that we had a computer welder. I told him we did all of our welding by hand. The image to the left is a very high resolution close up of a vertical weld in one of our Rachiele copper sinks. This is an unretouched photo. I doubt you will see this quality welding anywhere!. 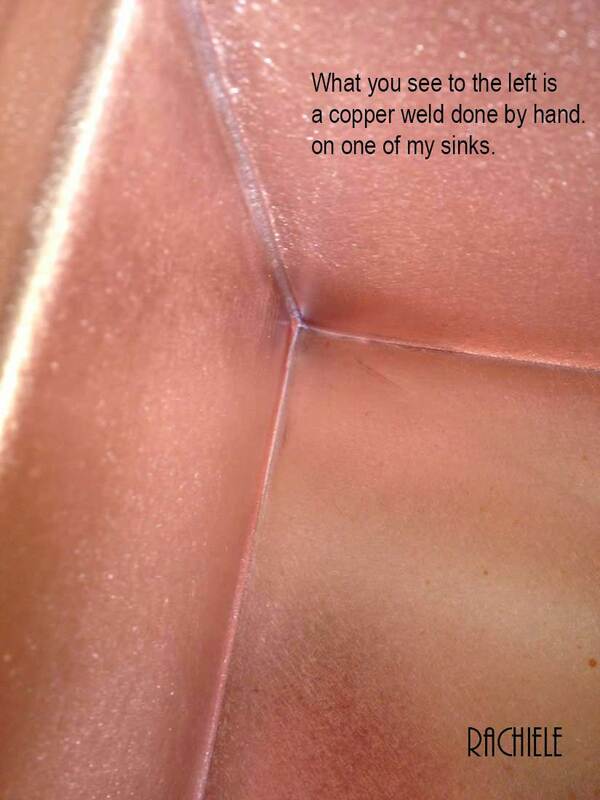 Our copper sinks are welded both on the inside and the outside of the corners to insure a strong lifetime weld. Click on the photo for a high resolution close up image. See the quality for yourself. You certainly will never see a close up image of anyone else's raw copper welding! Drain location: Center drains dates back to ancient Egyptian times when the technology available would only allow a vessel to drain fully if the drain were in the center. Folks, the United States sent a man to the moon! I think we have the technology to move a drain to the rear corner (where it belongs) and fully evacuate a sink. Moving the drain out of the way allows the user to place pots, pans, trays, etc. inside the sink without covering up the drain. This is one of the most important benefits of my sink verses all others on the market. Overall design of our apron front sinks: Our sinks are designed to fit cabinetry. That might sound obvious, but most are not easily installed in a cabinet. The rear of our apron is designed to partially overlay the cabinet face. This means that the cabinet cut-out does not have to be accurate at all. The sink covers the cut-out. I have seen so many apron front sinks (by others) installed with gaps between the sink and the cabinet. Here is a photo of one actually made in the USA! copper sink built incorrectly. The apron is way out of square. That will not be the case with a Rachiele apron front sink. Our sinks are true and square. My design allows you to fit an apron sink in the same size cabinet as the sink. Every other apron front sink will require a cabinet that is 3" to 6" larger than the sink (a huge waste of space). 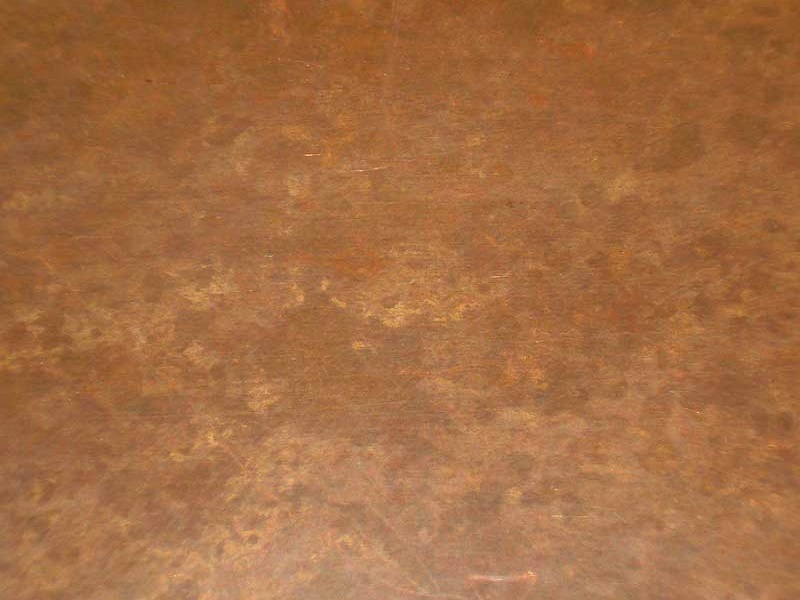 FAUX is a NO: Putting a faux finish (unnatural) inside a copper kitchen sink is a NO-NO! 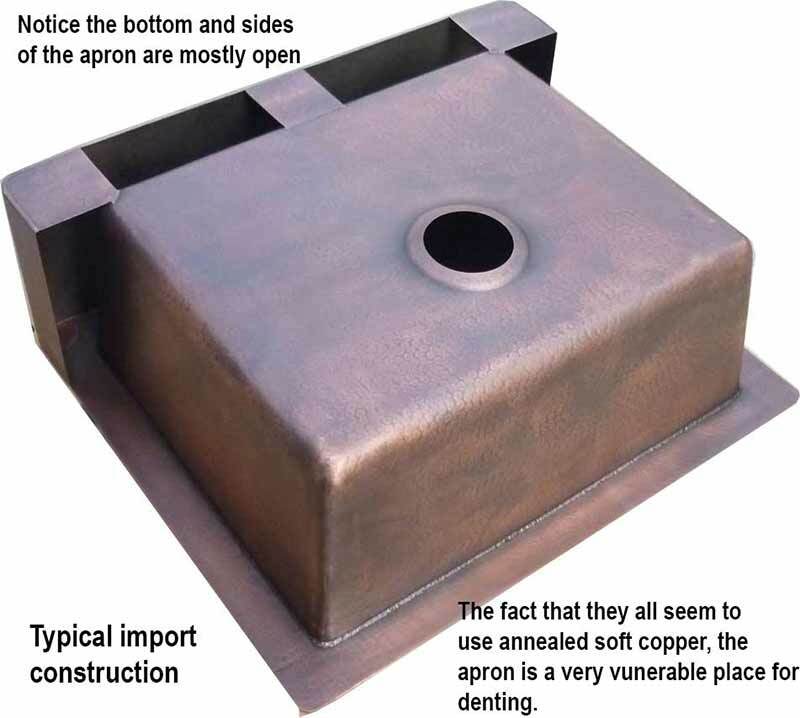 Sadly, the vast majority of our fellow copper sink manufacturers do not understand the basic properties of copper. 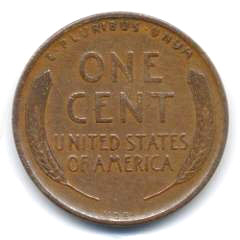 Copper will always turn the color of an old penny when in use in a home (a rich caramel color). Only when copper is outside (for over 7 years) will it begin to turn green. 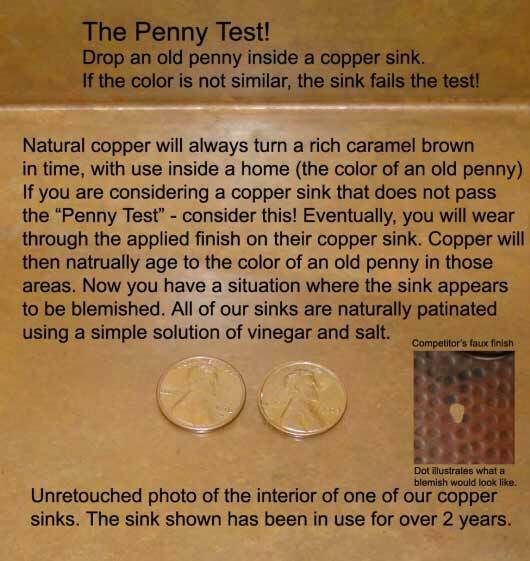 So, if you see a copper sink with an interior that does not look like the color of an old penny, watch out! Our interiors are never a uniform patina. A uniform finish is destined to look blemished in a short amount of time. We never lacquer or wax the interior of our sinks. 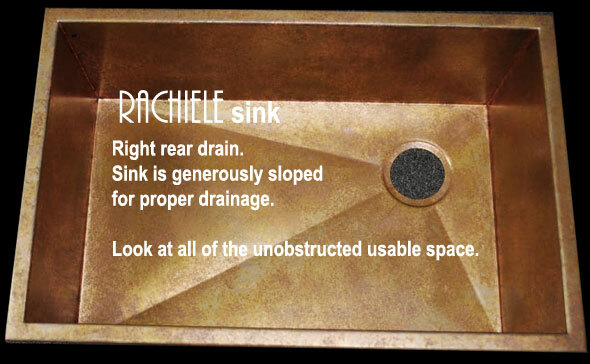 Just look at the bottom of our Rachiele apron front sink: (Click on images) correct construction of a copper sink Notice that the apron is closed on the bottom. That adds significant strength to the apron front portion of the sink. This is a photo showing a common construction technique of an imported sink. The bottom of the apron is attached by a couple of flimsy copper strips. It would be easy to bend this sink out of shape when leaning up against the sink doing dishes. It's what they don't show that is what you need to see. We show it all! We are proud of every inch of our sinks. I have stood on the apron of our sink. Sadly, if everyone was as transparent about their products as I am, I would not have to have a "bazillion" pages on my site dedicated to pointing out issues that "others" will not divulge. I guess I am a self appointed copper sink cop. That being said, If anyone (competitors included) find anything that is misleading or not factual on my site, please bring it to my attention. I promise to not only correct it, but to put the correction in bold type so it will not be missed. This is the phone message I received after she took delivery of the sink we made for her. She kindly gave permission for me to put this on our site. Now look at the back side of our apron. You will see that also is enclosed and welded to the sink body. Our apron is designed to overlap the face frame of the cabinet. This allows for a perfect fit every time. 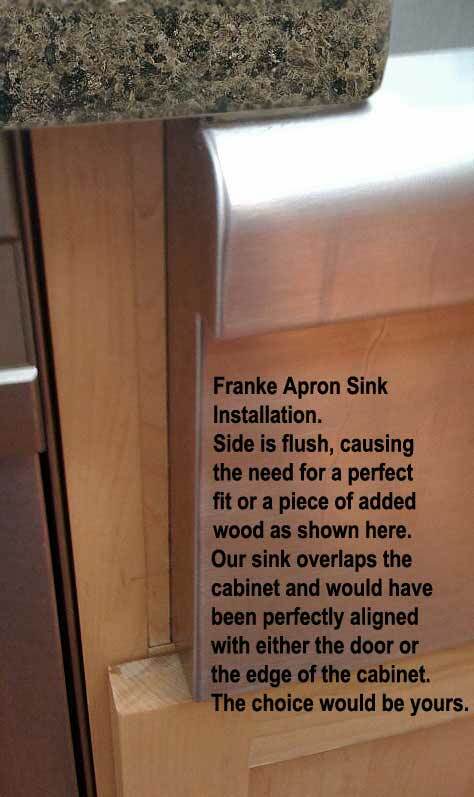 Here is a typical installation using a Franke stainless steel apron front sink. Franke stainless apron sink installation Notice that there is no easy way to install this sink and have it line up with the doors below or line up with the edge of the cabinet. It certainly does not look custom. This is how most other apron sinks have to be installed - not ours! By the way, notice the horrible vertical weld on the Franke sink. We would not even sell that as a "second". The photo has not been retouched, that quality is what Franke is selling! Beyond that issue, the distance from the front of the farm sink to the bowl is approximately 3". That defeats the purpose of a farm or apron sink. The extra 1 1/2" you have to reach to get to the bowl is a back ache in the making. I spoke to a surgeon today and he totally understood this premise. He says heavy people cause him to reach further in surgery causing more strain on his back. Here is our finished product: apron thickness 1 1/2" on Rachiele copper sinks. Our apron is 1 1/2" thick, with a right rear drain. Don't settle for outdated sink designs. There is no way to defend outdated designs, they just don't make any sense! (Update 10-15-09: I finally found an intelligent reason for having a drain in the center of a sink. If you use the sink regularly to wash your dog, a center drain will not get in the way of the four dog paws!) There you have it - a reason for a center drain! Now look at the bottom of what many other imported copper apron front sinks on the market look like: This particular sink is made of 16 gauge copper. All of our copper sinks are made of heavy 14 gauge cold rolled hard virgin US copper. Most imports use thinner annealed softer copper. Our copper is at least 8 times stronger. This is the hammering you will see on sinks by Manhattan Interior Designs who give the illusion their sinks come from Mexico, but they truly are imported from China. This is the bottom of their sink. Below is one imported from Mexico by one of the largest copper sink manufacturers online. Buy one of these and you need a caulk bazooka. View of the bottom of an imported copper apron sink In either case, you could easily push the apron inward. By the way, 99.6% pure copper is not pure enough! Ours is 99.9% What might be the other .4%??? The .01% of our copper is phosphorus. We intentionally use this as it is best for copper to copper welding. This is a photo of the underneath of one of their sinks. This is a photo of a typical Mexican sink. View of the interior of an imported copper sink. Please click on the image. As you can see, the finish is very dark. This is a very unnatural coloration for copper. As soon as you cut through the finish (and you absolutely will) you will expose the "recycled copper". Initially the exposed area will be a "new penny" pinkish color. In short order, it should turn a caramel brown - nothing like the coloration of the rest of the sink. The sellers of these sinks often say "don't worry, the copper will blend in with time". That is an out and out lie folks. Copper NEVER turns that color, and I mean never! So, if you want to take a chance with a semi-permanently installed fixture - go for it. If you do, all I can say is, you are likely going to remember my warning. Hey folks, I tell it like it is. No sugar coating. I have never been known for my diplomacy. As a side note - a friend just told me the definition of a diplomat is someone that can tell you to "go to hell" in such a way that you anticipate the trip! I think that is brilliant. Anyway, I am quite serious about copper sinks and hope you will be serious about learning as much as you can from my site and others. A well informed buyer will not be disappointed. We are in a different league, just as Rolls Royce is in a different league from Chevrolet. We understand that it is difficult to tell from photos online why one sink is more expensive than another. We are regularly asked to justify our higher prices. These photos should help in identifying some significant differences. Our sinks are built to last. We back that up with a limited lifetime transferable warranty. No other copper sink on the market has such a warranty. The below video illustrates a patented design that is used when you have existing cabinetry and would like an apron front sink. This is a perfect design if you are just replacing counter tops and are keeping your cabinetry. Small amounts of lead are poisonous. Lead affects the nervous system and the damage is irreversible. Years ago, in California, prior to the use of unleaded gas, there were tests done in yards nearby the highways - looking for lead content. Often the homeowners were told that their grass and dirt had to be removed due to unsafe levels of lead. Sadly, the FDA, nor the Consumer Protection Agency has paid any attention to the lead content in copper sinks imported from other countries. I can't tell you how angry that makes me. The reason I say that is I have never seen ONE import company prove that their recycled copper scrap is actually electrolytically purified. I have documentation showing 99.7% purity of our copper with NO lead, NO mercury and NO arsenic. The only other product in the copper we use is Pure Silver. We keep documentation from our copper supplier (on every delivery) on hand that indicates the copper is 99.7% pure, with no lead, mercury or arsenic and has been kept in a mercury free environment for storage. Specifically, our copper has an ASTM code of B370, which is 99.7% purity. We use a 122 alloy with an RB harness of 50. The yield strength is 51,800 psi compared to 6,700 psi of annealed copper. Our material is also RoHS compliant. RoHS restricts the use of mercury, lead, hexavalent chromium, cadmium and a range of other hazardous materials. If the company you are considering for a copper sink cannot give you official certification of the contents of the copper - run! I only purchase DOMESTIC 14 gauge cold rolled copper. I highly doubt ANY other company (even those building in the USA) are using domestic 14 gauge copper. "Just so you know what happened, their website discusses that they have the natural finish, plus 3 finishes that will never tarnish. They do not mention a film or build up finish, which it is. In speaking with them, they are using a catalyzed lacquer on the inside and out to protect the black nickel (which is electroplated I believe). The film finish lacquer started failing the first day it was installed - not little chips, but big sheets." (Email from contractor about a copper sink purchased from Thompson Traders)"
4. Double bowl verses single bowl sinks. Consider a paradigm shift. Single bowl sinks with rear corner drains will outperform any double bowl sink. You mention that double bowl sinks are obsolete and 10" deep sinks are not functional, why is that so? First of all, the most ridiculous sink design, which still prevails in our industry, is the center drain. The center drain dates back to ancient Egyptian times, when the technology did not exist to fully evacuate a bowl without a center drain. Today, we have the technology to completely drain a sink no matter where the drain is located. So... why do sink manufacturers still place drains in the center of a bowl? The answer is simple. The cost of retooling is expensive and the general public has not demanded the change yet. A center drain ruins the storage under the sink and also ruins the work space inside the sink. It is impossible to lay a large pan or platter inside the sink without covering the drain. So, what are the benefits to a rear corner drain? First, the work surface inside the sink is uninterrupted. You can place flat items inside the sink without covering the drain. Secondly, and equally as important, the inside of the sink cabinet is not cluttered with plumbing. With my single bowl sink and a right rear drain, you can place a double full size pull out trash cabinet on the left side. If you think of it, you will realize that most of the trash generated in the kitchen is generated at or around the kitchen sink. Why spend hundreds of dollars for a designated "trash cabinet" which takes up valuable space in your kitchen? Professional kitchen designers find this revolutionary design opportunity quite appealing. Now, let's talk about double bowl sinks. Double bowl sinks were designed prior to the invention of the dishwasher. We washed in one side and rinsed in the other. Let me outline the most popular concern I have heard about making the change from a double bowl sink to a single bowl sink. Most Americans use their dishwashers for dishes, cutlery and glasses. Some, like myself, hand wash most of the time without running the dishwasher. The old fashioned way was to place a grid drain in the left bowl so that dishes could be washed in the right bowl and set to dry in the left bowl. The bowl divider kept dirty water from getting on the cleaned items. If you have a double bowl sink I guarantee that you have to take your large pans, platters, cookie sheets, etc. and place them vertically at an angle inside one bowl. You then have to spin it around to wash it and you have to spin it around again to rinse it. It is impossible to lay them down inside the sink. The new way, using a single bowl sink with an offset rear drain, is far easier. Merely place our grid in the left side of the sink and wash on the right. The sink is sloped to the right rear so the dirty water never touches the clean dishes. Since the drain is in the right rear (if you are right handed), there is little chance for a misplaced dish to cover the drain and begin the maddening unintentional filling of the sink with dirty water. Simply use a soap filled scrub brush and run the water gently while cleaning and rinsing. I have tested this method and it uses less water than filling a bowl. You say you occasionally fill one bowl with soapy water to soak an item and need the second sink for other things. No problem! No problem! We have a secondary bowl that will sit on the ledge or step of our workstation sink and you have accomplished the same thing without a PERMANENT divider that causes more problems than it solves. I must have been your most difficult customer. I fought you all the way. Both my husband and I were hell bent on getting a double bowl sink, I am a bit embarrassed to say - you were right. After all the fussing, we are now one of your loyal followers. Yes Dino... a single bowl sink with a right rear drain makes so much sense! OK, I said it. Thank you, thank you, for being so insistent. (and for taking my countless phone calls) We could never have believed how wonderful your design is. We both wish you much success. You deserve it. One more thing, please feel free to put this note on your web site. Also I want to tell your potential customers that Dino does really answer the phones on the weekends. Our plumber had a question about the disposer thingy and Dino called us back in less than 5 minutes on a Saturday afternoon. Thank you for all of your help and the photos of our gorgeous sink before it shipped. We will send photos back once we finish the remodel project. Thinks are still hectic around here. 5. Is a copper sink suitable for food preparation? In short, the answer is yes! It is the most hygienic surface you could possibly have for food preparation. Keep in mind, many homes have copper pipes for drinking water. 6. Will pots and pans dent my copper sink? Denting is unlikely in our copper sinks, very likely in others'. We use a heavy 14 gauge cold rolled copper for our sinks. Cold rolled copper is significantly harder than annealed copper (which can dent and bend easily). Annealing occurs by the diffusion of atoms within a solid material, so that the material progresses towards its equilibrium state. Heat is needed to increase the rate of diffusion by providing the energy needed to break bonds. The movement of atoms has the effect of redistributing and destroying the dislocations in metals and (to a lesser extent) in ceramics. This alteration in dislocations allows metals to deform more easily, so increases their ductility. That is precisely why we do not use annealed copper. Our cold rolled virgin copper is up to 8 times stronger than annealed copper. Our copper is just about as hard to dent as a 16 gauge stainless steel sink. It is just about as hard as my head! Being Calabrese (a location in Italy known for those who are stubborn) I have been accused of being hard headed at times. I recently discovered (watching a television show on the History Channel) that recycled copper is rarely used for copper wiring - as it is too expensive to purify to the standard required for copper wire. Virgin copper is pure enough for copper wire. We use ONLY virgin copper for your sinks. There is a massive supply of virgin copper in the US. Watch this demonstration illustrating the strength of our copper. Take a look at the chart below (taken from Wikipedia) Note the hardness difference between annealed copper and cold rolled copper. We use only cold rolled copper. Now look at the yield strength and tensile strength differences. You can see that the differences are very significant. I am not aware of any other copper sink manufacturer that uses 14 gauge cold rolled copper. 7. I am a bit nervous investing in a custom sink that I have not seen. Can you assure me I will be pleased? Well, no. We can not assure that you will be pleased, however, we do guarantee you will be more than pleased - you will be thrilled. We have been selling copper and stainless steel sinks since January of 1999 and have offered a guarantee that states: "If you are not thrilled with the quality of our sink, we will buy it back, pay all shipping costs and send you a check for $100 in consideration of your inconvenience. "In the years we have been offering this guarantee, we have never been asked for a refund! I am also positive that all of our customers are thrilled. Don't believe me? Google Rachiele sink complaints. You won't find any. Lastly, we recommend you make any purchase with a credit card. Credit cards protect your investment. If you have a grievance with any company where you use a credit card, simply call the credit card company and they will begin a dispute. Often, they will refund your money immediately until the issue is resolved. We have never had a credit card dispute. We offer a transferable lifetime warranty with NO disclaimers regarding the use of acidic products or bleaches, etc. We have looked at some of the other so-called lifetime warranties. They do not pay for shipping costs and there is generally a long list of items that can not be used inside the sink. Most actually indicate that their sinks must be dried out after each use! We firmly believe that any quality product with no moving parts should have a lifetime transferable warranty! We could not offer this type of a warranty on a copper sink if we did not use 14 gauge cold rolled hard domestic copper. Look under the products tab at the top of every page for our full Warranty information. 9. How do I order a custom product from you? Simply call me from 8am to 6pm EST Mon-Sat. We will discuss your needs and develop a sink perfect for your situation. We have designed very complex sinks by phone, confirming with detailed drawings. Once we agree on a design and a price, we will email you with detailed drawings and a purchase agreement. We will give you an expected ship date as well. 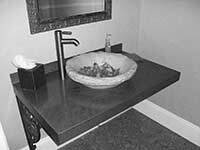 We have been offering custom sinks for about 18 years now with a 100% track record of thrilling our customers. See "The Process Page"
10. You mention a self healing interior. What exactly does that mean? We only offer a naturally weathered patina on the interior of our copper sinks. We do not artificially color the copper with heat, chemicals or colored waxes. Our method allows the copper to heal back to it's original coloration no matter what you do to it. That is why we are the only company that offers copper sinks with a lifetime transferable warranty with NO disclaimers regarding what you can and can't do inside the sink. We are one of a handful that do not require drying the copper sink after every use. Just to prove that our sinks heal by themselves, I did an experiment and recorded it with a camera for you to see for yourselves. The sink bottom shown is the one we use in our office kitchen. It does not get nearly as much use as a household kitchen sink, therefore the patination process will be slower in our office than would be expected in an average home. 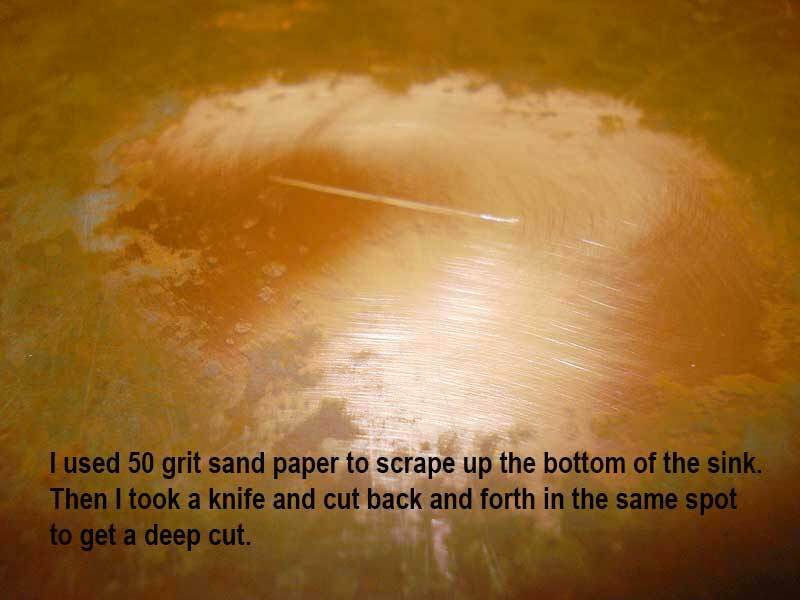 To begin the process, I took sandpaper and sanded through the patina on the sink. Then, I took a very sharp knife and made as deep a scratch as I was able to make. 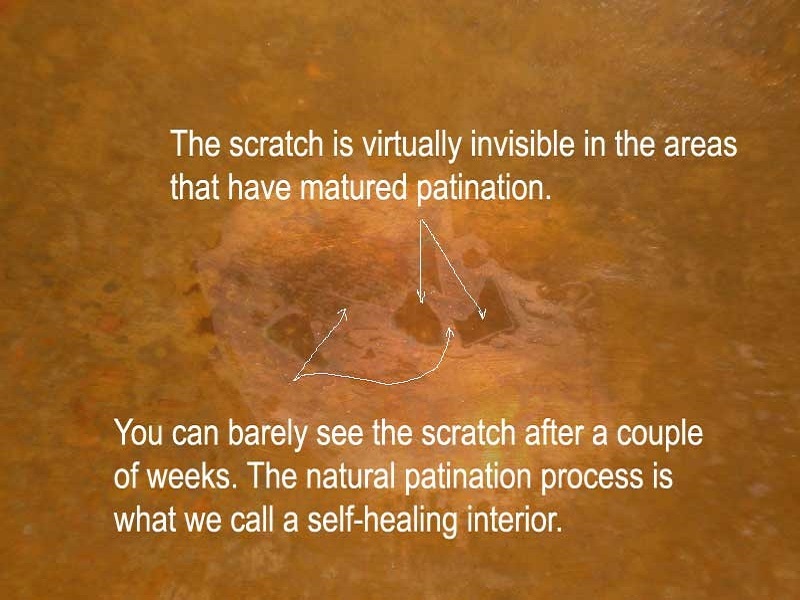 I did this to prove that even the deepest scratches become invisible over time and that the patina that we apply before the sink ships to you is the same coloration that copper will naturally weather to. Click on the images to see the close up detail. The second photo is between two and three weeks old. The last photo is 5 weeks old. There is no sign of the missing patina nor the scratch. Keep in mind, this sink hardly gets used. In a normal kitchen environment, the process would have resolved in a matter of a week or so. As you can see, there really is no way to ruin the interior of our sinks unless you try very hard! By the way, when that sink was in our showroom, I had a challenge. If anyone could find the scratch in our sink, I would have offered a free one! Yep, I have offered that to quite a few visitors. Nobody was able find the deep scratch. Update March 2013: I sold this sink for $1500 to a customer who came in to see the sink. The sink looked brand new. How many sinks can you sell, that have been used daily for over 9 years, for $1500? Rachiele copper sinks hold their value. The last photo was a snapshot I took just before our client came to pick up the sink. I am not exaggerating when I say the sink looked brand new. 11. What about stainless sinks? How do yours compare? Those who know me, are fully aware that I am a straight shooter and "tell it like it is" no matter how politically incorrect it is, without much regard to the "marketability" of my comments. I have to say that we are not the only fine quaility stainless sink manufacturer in the world. I would put Julien Sinks, of Canada, in a somewhat similar quality range as ours. That being said, I have seen sinks built by other so-called Luxury brands have ripples in their stainless due to careless quality control. So... why buy a Rachiele stainless steel sink? First, the right or left rear drain is THE most important reason. Investing in any sink with a center or rear center drain is simply ridiculous. There is no logical reason for the drains to be in either location. With our design, you can place large items in the sink without covering the drain. You can also use our sink like a double bowl sink. Just wash on the right, set off on the left. No crazy divider in the way. Secondly, our Millennia stainless is exclusive and helps to hide scratches and water spots. Thirdly, we offer a rustic matte stainless that looks just like zinc and is very easy to repair if scratched. This, to my knowledge, is unavailable elsewhere. But, if you find a right rear drain stainless sink that is made by one of the few quality stainless steel sink manufacturers, and it is less expensive than ours - buy it. Really!!! Julien, in Canada builds a great quality stainless steel sink. They are about the only company I can recommend other than mine. Now, if you are looking for a workstation sink, nobody builds one with a design even close to the functionality of my NexGen sink. There isn't even a close second. A note about stainless sinks made in China. I have heard, second hand, that quite a few sinks made in China have rusted. I was sent a photo of a Kohler sink made in China that was still partially wrapped and had already rusted. The photo to the left is the workmanship of a local Orlando American Manufacturing company that, along with miscellaneous metal work, also builds sinks. This was their attempt to make a sink with interior ledges. As you can see, there is no comparison with the quality of our sink. From a photo - far away, they all look good! My sinks can be inspected closely because we inspect them closely. 12. What is Dino's favorite meal? Sad to say, but a great Hamburger does it for me. Another favorite is Timpano. That is a family recipe that was made famous in the movie "Big Night" written and starring my first cousin Stanley Tucci. 13. 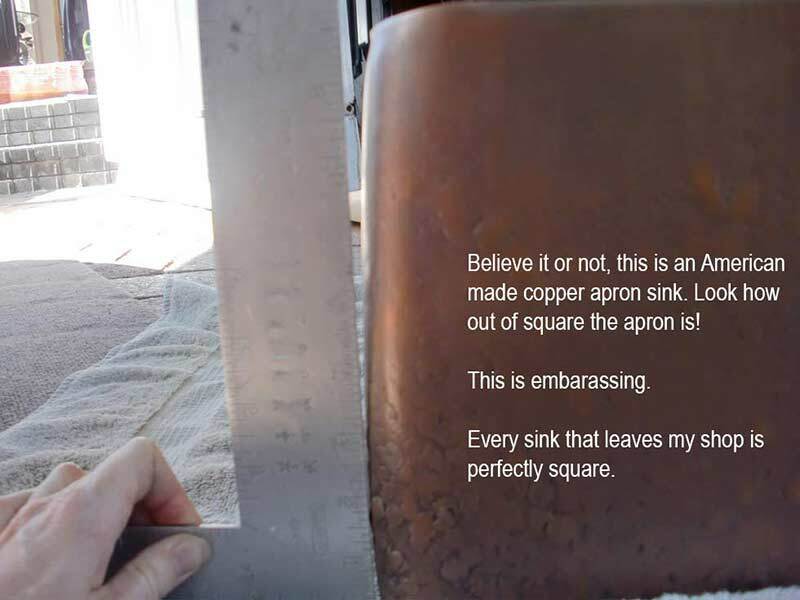 Why are so few of your copper sinks hammered? Due to the fact that we use an exclusive cold rolled 14 gauge copper, the hand hammering looks distinctively different than the imports. More importantly, the hammering does not show up well on any finish other than weathered. Our weathered patina is a great match with hammering if you like the hammered look. I strongly feel that hammered sinks became popular due to the fact that that was the only way the original imported copper sinks would be tolerated in the U.S. market. If the imported sinks were not hammered, the sides, fronts and bottoms would be wavy and would not look like a quality sink. The darker finishes and the hammering hide poor quality workmanship quite well. Now, hammered copper sinks are seen in the home centers for a fraction of what our sinks cost. Mark my words, hammered imported copper sinks will become dated with regard to high end fashion very soon. Our hammering looks hand-hammered because it is. Our hammering is a statement of quality, not a cover up for poor quality. Secondly, and most importantly, the hand hammered sinks (like you see with the imports) must be hammered using a soft annealed copper. It is impossible to hand hammer our hard copper and achieve the look you see on most copper sinks. Our cold rolled copper is much stronger and will hold its shape even with the constant use of a heavy garbage disposer. Lastly, when you hammer a sink like the imports, you create little ponds inside the sink which make it difficult for the water to evacuate properly. That is one reason the imported sinks have to be dried after each use. 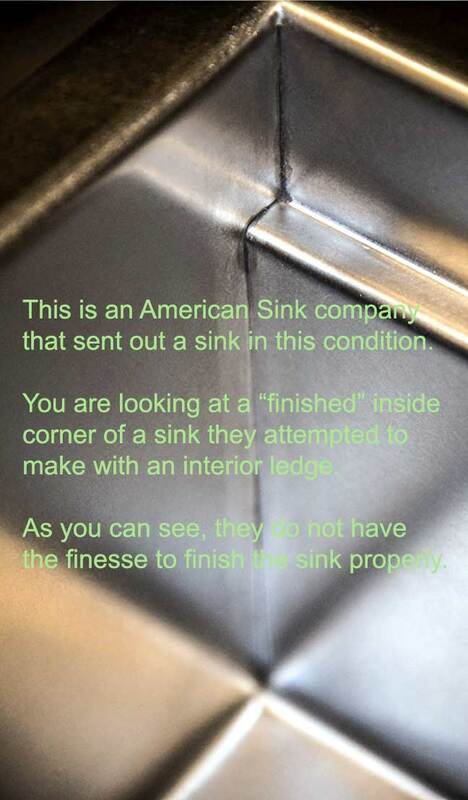 Our sinks have a significant slope to the drain, so this is not an issue with our hammered sinks. We offer hammered aprons including the bowl, or just hammered aprons. Hammering must be done prior to fabrication, therefore our stocked sinks can not be hammered. By the way... have you ever seen a penny that is as dark as the sink pictured above? When something cuts through the artificial finish on the sink above, the copper will turn the color of our sink below (our sink). Don't you think it will look like a blemish? The penny in the photo is a real copper penny from 1957. As you can see, our sink is a match for a naturally aged penny - that is because our copper is naturally aged copper. 14. Why are most of your sinks showing zero radius corner construction instead of radius corners? 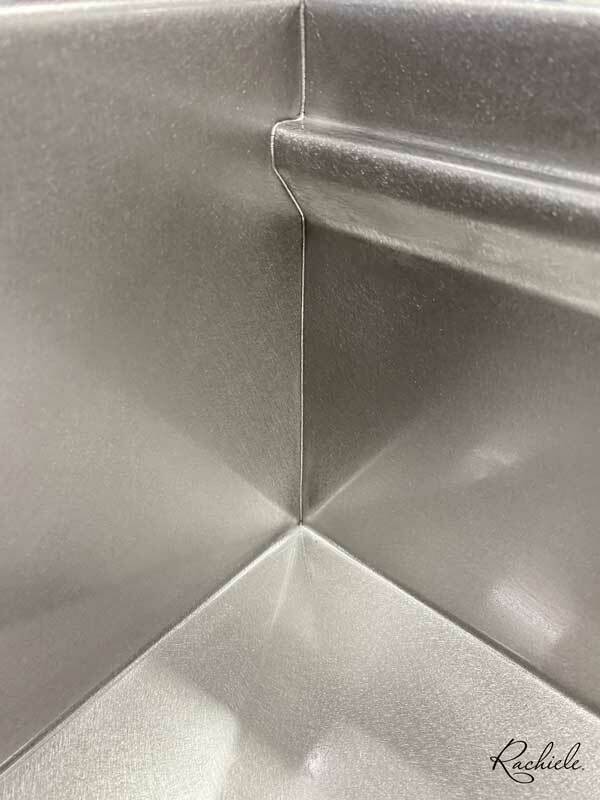 We are able to produce either square or radius corners. We have found a strong preference for the square corner sink. Here is some of the feedback we have received from designers and architects as well as homeowners. A) The square corner sink looks more like a custom sink than a radius sink. B) The cutout in the granite looks more pleasing. C) The interior usable space at the bottom of the sink is significantly larger with a zero radius corner construction. 15. Isn't it difficult to clean a square corner sink? First of all, the transition from the bottom of our sink to the sides is not perfectly square on the vast majority of our sinks. There is a slight radius. Even if it was square, a sponge gets in the corners quite easily. I just wanted to write and tell you how much I LOVE my copper sinks. We purchased 2 sinks for our kitchen- one farmhouse style sink and one bar sink. First of all- they are absolutely gorgeous - the first thing many people notice when they come into my house. Moreover, the drain placement is genius! In my larger sink the drain is on the side rather than the middle. This makes perfect sense so that the drain is not blocked when washing pots. Furthermore, your sinks are custom made. 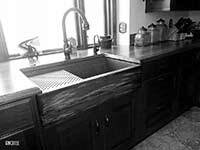 Most farmhouse sinks are 10 inches deep. If you are taller than average, cleaning a dish in a 10 inch deep sink is hard on one's back. I was able to order an 8 inch deep sink which makes all the difference! Most importantly, I love your sinks because they are EASY to take care of (yes- I am lazy). I used to have a stainless steel sink in my kitchen and the smudge marks used to drive me crazy. I really don't do much to keep my sinks looking beautiful now- I simply rinse them out with soap and water while washing my dishes. Nothing else!!!! 16. How strong are your copper sinks? Pure copper is not all the same! This video speaks for itself. There is no way you can do this in a 16 gauge sink, or a 14 gauge sink unless the material is cold rolled copper. As far as I know, most of the imports use annealed copper ( much softer). In this video I was standing inside a customer's sink without any concern about damaging it. Let's face it, I needed to go on a diet. Since that video, I have actually done so! The second video I am standing on the apron of one of our sinks. There is no comparison between the strength of our sinks and any other on the market. We use 14 gauge cold rolled virgin US copper. The vast majority use recycled annealed copper. The copper we use can be up to 12 times stronger. That is why we are the ONLY copper sink manufacturer with a lifetime transferable warranty and a buy back guarantee if you are not thrilled with the quality of our sink. 17. What's up with the right rear drain? It just makes sense! If you are right handed, you will always pick up a dish with your left hand and scrape food off into the disposal with your right hand. Think about that motion. If you are standing in the center of the sink, your right hand will automatically end up in the right rear corner. A right rear drain (or left rear drain if you are left handed) has many more features. You can wash on the right and set off to dry on the left - just like a double bowl sink. When you have larger pans, cookie sheets and platters, you can now set them flat down inside the sink without covering the drain. When you rinse those items you are not battling with a divider in the way. Lastly, the inside of your sink cabinet is now almost empty! You can likely put a double rollout trash system behind the opposite door from the drain. Think of how convenient that would be. Most of the trash is generated at the sink. Think about it for a minute. When you unwrap vegetables, the wrapping is thrown away. Same with meat and poultry. Canned goods too! Why dribble over the counter or the floor when you can have your trash receptacle right under the sink? The best analogy I can give to illustrate the difference between a right rear drain and a center drain is as follows. Imagine all the shoes you own are uncomfortable. At the end of the day, your feet ache. As soon as you put them on, there is a bit of discomfort. You, however, have never owned a pair of really comfortable shoes. You go on day after day and the discomfort becomes natural, it is a part of your day. The shoes, however, are in style and they are not so uncomfortable that the pain is unbearable. One day, you try on a new pair of shoes. Not only is there no pain, but they actually make your feet feel so much better than they ever have. From that day forward, you could not go back to the old shoes. Suddenly, the comparison makes the old ones feel so much more painful. 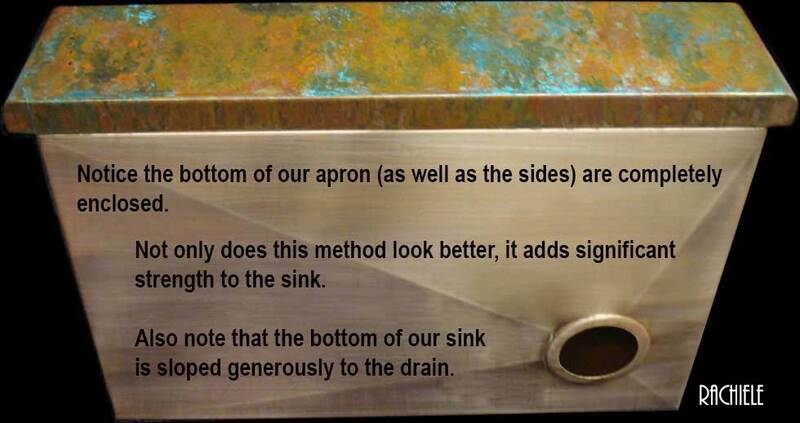 The above analogy describes how I and countless others have felt about the drain location difference in our sinks. I have so many emails and phone calls from past customers telling me that my description did not come close to the reality. They tell me they could never go back to a center drain sink. The best part for me is that these folks will be customers for life. We have been in business 16 years now and we receive quite a bit of repeat business. In short, you can't imagine the difference - but once you experience it, you will be a strong advocate. Wash on the right, set off on a rack on the left. Use the sink like a double bowl sink except you don't have that stupid divider in the middle. There is a place for a double bowl sink. If you fill a bowl regularly, for whatever reason, you need a double bowl sink. Even with a double bowl sink, the drain should not be in the center of the bowl! 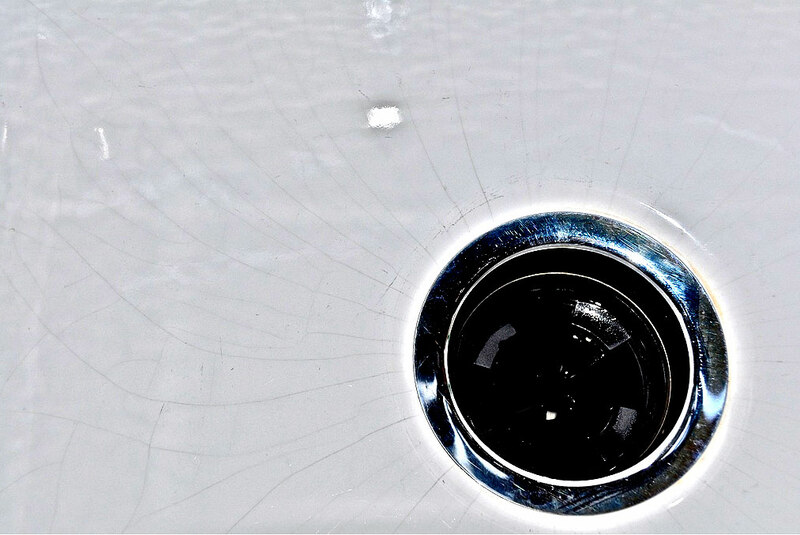 There is absolutely no logical reason to have a drain in the center or rear center of a sink. The reason everyone else does that is because it is simple. Oddly enough, most of the copper sink manufacturers can't even get their sinks to drain properly when the drain is in the center. Imagine trying to put the drain in the rear corner. The sink would come with a siphon. The major manufacturers have started to see the light. Several have begun copying my idea. I am thrilled. I know my sinks can not be afforded by most folks. Having a less expensive option is nothing short of wonderful in my book! 18. Can I have an apron front sink if I am only replacing my counter tops? Only with Rachiele! We own the patent. Take a look at our video that shows how simple it is done. We offer it in copper and stainless. We also have a patent on a situation where you are keeping your existing counter tops and want an apron. I can even do this with a top mount sink where you get to keep your existing counter top! A few cuts in your existing cabinetry (and none in the cabinet) and you have a wonderful apron sink! 19. Why 316 Marine Grade Stainless when everyone else uses 304 Stainless for their sinks? 20. What if I live in a different time zone or a foreign country and your hours of operation are not convenient? I ask that you call any time. One of two things will happen. I usually answer the phone, whether it is early in the morning or in the evening. The phones are forwarded to my cell phone 24/7. If I do not answer, please leave a message. I will call you back as quickly as possible. That being said, I generally go to bed around 9 because I am up before 5am. Calls after 9pm (Eastern) will likely be returned the following day. By the way, I do answer calls on the weekends. We always speak with you to get a good feel for what you would like your sink to look like. Secondly, we send a photo of the apron prior to our final process to go over any adjustments you might like. Lastly, we can also send a final photo for your approval prior to shipping if you feel that is necessary. We are here to make sure you are thrilled! The vertical portion of all copper apron front sinks is protected with a proprietary clear topcoat. This topcoat locks in the pattern and color so it will not change over time. 22. What is a patina on copper? Oxidation: Oxidation refers to the chemical changes that a substance undergoes when it is exposed to the elements. Iron, for example, forms rust when it is oxidized. When copper is oxidized, however, it forms a unique patina layer that, in addition to the color change you can see, provides a protective barrier that you cannot see. While oxidation leads to the corrosion and corruption of some materials, it does not affect the stability of copper. 23. How are your sinks shipped to us? Why are large sinks $190 or more? All but very small sinks are shipped in custom wood crates, with significant 2" medium density foam on all sides. Our shipping costs on larger sinks might seem a bit high until you see what costs are involved. Every sink is packaged in a custom made plywood box - my cost ($100 to $150) The packing material we use costs $100 per 4X8 Sheet and we get about 3 sinks per sheet. ($33) The box has a monitor on it to indicate rough handling. ($12). Depending on where you live, the UPS published rate ground charge will be approximately ($120 to $280), including insurance - plus a ($14) additional UPS surcharge for packing in plywood. Most larger sinks, in the crate, weight over 90 pounds. If you add up all of the costs, plus the lowest cost for UPS, you come up with a whopping fee for my shipping costs. We claim to offer the finest copper sink in the world, and I try to offer the finest customer service in the world as well. My eyes are always the last ones on your sink - and I am picky - my name is on the sink! As you can see, what we charge for shipping, includes much more than you might expect. Since we have packaged in this manor, almost ZERO damage! Please note that all of our shipments are monitored by ShockWatch. Each box we ship has a device which will indicate if the box has been mishandled. Studies show that shippers take better care of products shipped with monitoring devices clearly labeled on the box. This system has been shown to significantly reduce shipping damage. Your sink will be shipped with one or two impact monitors. If your box arrives and the indicator shows red (meaning the box has been mishandled) accept the delivery and note this fact in writing with the UPS driver if you can. It is unlikely that the sink will be damaged, but this is an indicator that alerts you that you should check the sink carefully. This is just one of the many things we do for you to insure you get the very best! 24. Are your sinks inspected before shipping? This is the station where we test every sink. This happens to be a very large (59") sink. We level the sink perfectly, then we fill it completely with water. We apply air pressure to all of the welds and inspect for pin leaks. Then we drain the sink to make sure all of the water drains properly and there is no pooling. I was there for most of that process this morning and thought I would take a quick photo of the sink while at the factory this morning. The hot spots (circles) on the back are from spot welding a support underneath the deck. I have not done this before, but the customer is using two heavy Waterstone faucets plus a soap dispenser and thought the deck could use some extra support, so we added some underneath. This is the sink prior to any finishing in the shop, such as grinding and polishing the welds and completely sanding the sink. That process will take the better part of two days. Then I will pick the sink up and bring it to my office location where Lori will begin the patina process. 25. What are the advantages over cast iron or fireclay sinks? If you would like some unbiased comments about fireclay sinks, there are quite a few on the Garden Web forum. Also, take a look at this Garden Web thread talking about chipping in Kohler Cast Iron Sinks. Also, take a look at this Garden Web thread talking about cracks in Kohler Cast Iron Sinks. 26. Why are some faucets cheap and others expensive? 27. 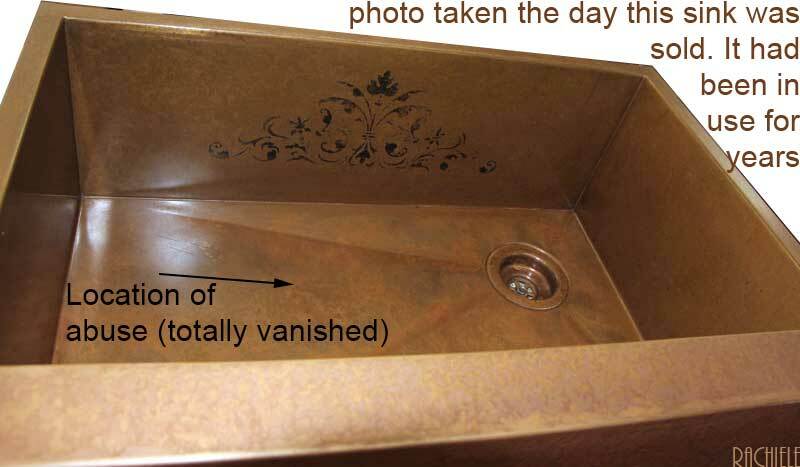 Why do some sites talk about a finish on their copper sinks? 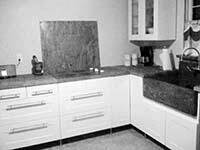 Many sites do indeed refer to finishes or sealant products on their sinks. A finish or a sealant is only appropriate on the apron portion of a copper sink. There is NO finish, nor sealant, that will withstand the use of the inside of a copper sink. You will never find one of these companies with a warranty longer than a year. We only accelerate the natural aging process of the copper on the inside of the sink using household vinegar. The patina will always grow back to the color we originally aged it to. 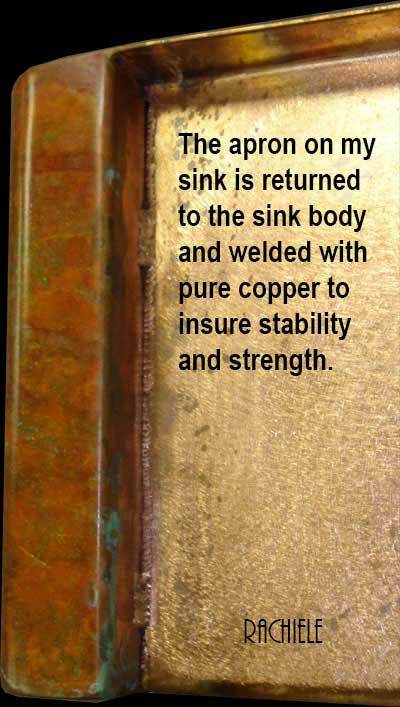 That is why we are the only copper sink company with a lifetime warranty with NO disclaimers. 28. I have heard of copper sinks plated in nickel. Are they OK? This, in my humble opinion, nickel plated copper sinks are the biggest fraud perpetrated on the public. The folks who sell them should be ashamed of themselves. There is no nickel plated sink on the market that will last! I personally know some of the metal platers that do this type of work. They all tell me they offer no warranty and they also say the plating will never last. Do yourself a huge favor and stay away from nickel plated over copper sinks. 29. Do you ship your sinks overseas? We ship overseas all the time. We have shipped to many parts of the globe with no issues at all. Shipping takes one week or less. We have shipped to Australia, Israel, the United Kingdom, the Saudi Arabia, Guam, Mexico and Canada. Canadian customers pay NO DUTY. We can supply NAFTA papers. We have recently negotiated very low UPS rates for overseas shipments. For example; the published UPS rate for a 36" copper apron front sink we shipped to Australia was $1005.98. We charged our customer $550 - and our fee includes a custom plywood box, a "ShockWatch" monitor, all the packing material and insurance. No one can ship a sink overseas as inexpensively as we can. Duties, GST, VAT, etc. are charged to you locally. That customer paid about AU$400 in customs (a bit lower than she expected) on a $3,000 sink. 30. Have you ever had a problem with one of your sinks? Absolutely! We are not perfect. I do have to say that there have only been a handful issues in the 18 years we have been in business. For me, the way in which a problem is addressed characterizes the company. Let's start with the first problem. It was back in 2003. We had a customer that insisted on a special patina on the INSIDE of the bowl. I tried to explain that it was not a good idea, as the finish would wear off at some point and I could not guarantee the finish. They kept insisting, so the artist that worked for us did some research and found a clear top-coat manufactured by DuPont that claimed it was virtually indestructible. We contacted the customer, indicated what we had found and again mentioned there could be no warranty on the finish. They were fine with that. Four months later, they said the finish was flaking off in the bottom of the sink. I asked if they had somehow cut through the topcoat. They indicated they had not. The call was two weeks prior to Thanksgiving. I hopped on a plane to Atlanta and rented a car, drove to the house and looked at the problem. Upon my inspection, it was clear that there were cuts in the top coat, however I did not mention it to the homeowners. I suggested we take the top coat off and go back to our standard weathered self-healing patina. They agreed. I flew my artist up to hand sand off the top coat (on two sinks) and apply the natural patina. That project took the better part of a day. All of this was accomplished a week prior to Thanksgiving. We sent a generous gift basket as an acknowledgement of the inconvenience. I also noticed, while I was there, that they needed a cover for a floor vent. I measured it and had a custom one made as a gift. The fourth sink down on this page is a photo sent in by that customer of their sink. The second problem was a minor one, but costly. We had a customer that did not want a lacquer on the weathered patina apron portion of her sink. This was the first request in years of its type. Our artist lacquered the apron by mistake (out of habit) and I packed it not noticing the lacquer. The sink was going to California. After it shipped we realized the error. We had UPS overnight the sink back to us. We fixed the problem the same day and overnighted it back to California the same day. She had her sink within 48 hours of the original expected time. The third problem was a scratch on the apron of an oil rubbed bronze patina. I found the premier furniture repair specialist in Chicago and sent him to the home to repair the scratch. Normally, this would be a do-it-yourself fix. Our old oil rubbed bronze patina was not something easily reparable. We have since discontinued that particular variety of oil rubbed bronze on our apron sinks. The customer insisted it was not caused by abuse. The professional that went to the home said "In my professional opinion, what I saw was abuse". No matter to me. I just wanted to have a happy customer. Lastly, we have had many false alarms. The most recent was a complaint that our sink did not drain fully. I asked them to check to see if the sink was installed properly and the counter top was level. We went through all the possibilities I could think of. I am pretty certain our sinks will drain well when they leave here, so getting a call like that is puzzling. I asked the customer to send me a photo of the drain area showing where the water was pooling. During that conversation, I offered to build them a new sink. Thankfully, the photo was clear. I noticed something odd about the drain. It turned out, the husband installed the drain and put the washer on top of the sink instead of under the sink - causing the drain to sit very high and not allowing the water to drain. They fixed their mistake and all is well. 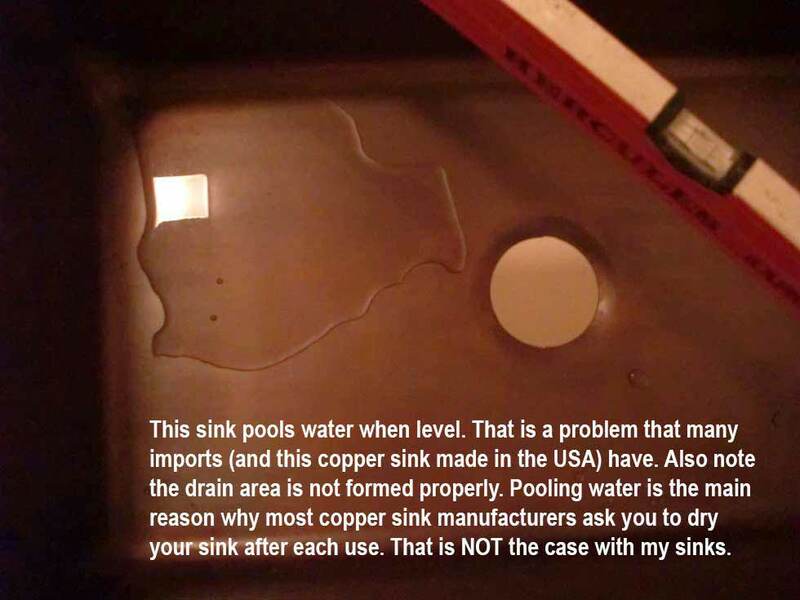 That being said, I get calls almost daily with problems with "other manufacturers'" copper sinks. I am asked often how to fix the problem. In most cases, there is no fix. 31. IAPMO Certification - what does it really mean? Sadly, this certification is difficult to understand. Once copper sink company contacted me irritated with the fact that I was putting information on my site that he felt was untrue. I had indicated that the IAPMO certification did not test for 99.9% copper purity. He was not correct, he was misinformed himself. Believe it or not, you, as a consumer, have to PAY $69.95 to read the IAPMO ICG 194 certification. I did so, and since it is copyrighted, I will give you the gist of the portion that involves copper sinks. The only reference to copper at all, was that copper alloys shall contain at least 58% copper. There is a minimal corrosion test and a load test to see if there is evidence of cracks or other forms of failure. Unless I am missing something, that is the bulk of what the certification indicates with regard to a copper sink. Believe it or not, in order for you to read what IAPMO tests for, you have to purchase the 3 page document for $69.95. I made the purchase. The bottom line... do your homework. IAPMO certification means very little as far as I can see. Now a message to those of you who feel like you (competitors) should threaten me with your attorneys for printing false information like the above person did. I suggest you do YOUR homework first. Secondly, as I told the person above, I am a friendly guy and I never want to mislead or misrepresent. If anyone finds anything on my site that is misleading or false, bring it to my attention and I will verify it, and if it is wrong I will not only remove it, but will put a statement indicating that I unintentionally mislead. I am easy to contact, so feel free to do so, but don't go off on a rant unless you have done as much research as I have. 32. Why do Rachiele sinks have more usable interior space? 33. Does Dino really hide his own Easter Eggs? Well, not quite yet... I do, however, have quite the case of A.D.D. 34. Why are Rachiele sinks 8" deep? I studied ergonomics as a kitchen designer. I have spent years studying the ergonomics of kitchen sink usage. Believe it or not, the simple movement of placing a drain in the rear corner makes a significant difference in how the sink is used. By placing the drain in the rear corner in a single bowl sink, the user will place all items flat down inside the bowl to wash or scrub them. Think about how you wash a cookie sheet for example. If you do not have one of our sinks, you will put the cookie sheet in the bowl at an angle, washing the bottom half, then spinning it around to wash the other half. Rinsing is likely a balancing act, trying to rinse the cookie sheet without getting water on you or the counter top With a Rachiele sink, you will simply place the cookie sheet in the bottom, to the left of the right rear drain. You will scrub the entire sheet, then turn it over and repeat. Rinsing is simple, just lift a corner and rinse. I have found that you will be working at the bottom of our sink all the time, hence depth becomes an issue with regard to ones back. An 8" deep sink will be only 26 1/2" off the ground at the bottom work area. That is about 4 inches lower than a desk height. Measure 26 1/2" off the floor and put a box at that height. Imagine bending over and working at that height. Any lower will certainly be a back ache in the making. There are those of you who might wonder if tall pots will be an issue. I have not found that to be the case with one important component... A well designed faucet. The Waterstone Pull down faucets are ideal for this. Lastly, let me tell you a story regarding a past customer. About 12 years ago, a gentleman ordered two sinks from me. We had the discussion about sink depth and he insisted on 9" deep sinks, which I built for him. Last year, he called me and asked if I still had the drawings for his sinks, as he was building his retirement home and was duplicating his existing kitchen. I was able to find the drawings. He said "I would like the exact same sinks, except one thing... make the depths 8", you were right... 9" was tough on the back." By the way... If we built the same exact sink, with a rear center drain or a center drain, I would be recommending 9 or 10" deep sinks. Drain location is that critical! Rachiele has everything you need to create an awesome kitchen! Shop Now!